"We have attended two other Taekwondo schools before we moved to Melbourne and started with Master Choe. We love it. Everyone is treated with respect and kindness and Master Choe is very talented at what he does. This is the right place for any age and it's affordable. I also prefer to learn the Korean Taekwondo as opposed to the Americanized version. The culture of the art is important to me." “I have been impressed with Master Choe’s teaching from the first time I saw him in class. He has great respect for his students and inspires them to work hard. He cares deeply for each student, and he inspires great loyalty. My son has become much more confident and controlled since he began studying Taekwondo at Choe’s Martial Arts, and he cares a great deal about what Master Choe thinks of him. Seeing my eleven year old son now, as a black belt, learning to teach other children and adults, is an amazing experience. Where else could he have the opportunity to learn how to teach from a master teacher?" "I'm really lucky that I found Master Choe. During the several years I've trained with him, I have learned so much. Master Choe has shown that he really is probably the best martial arts teacher in Brevard. He really knows his stuff, and he's very good at teaching us the right technique and making sure we do it right. I enjoy doing self-defense, sparring and weapons. As a member of Team Tempest, I have gone to several state tournaments. 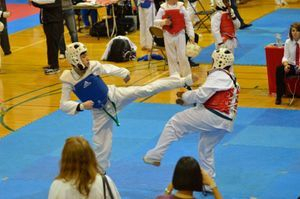 I enjoy these tournaments because I get to test my skills against students from other martial arts schools in the state."